For those of you who enjoy a good Sunday nap, this is for you. When I announced today that I was going to take a nap after church, Ashlynn said, very petulantly I might add, "Mom. I'm sure you can survive one Sunday without a nap!" Brian heard her as he was walking out of the room and and could not pass up an opportunity to razz his little smart mouth. He would say over the next 5 minutes, "Ashlynn. I'm sure you can survive one Sunday without watching a movie! ", "Ashlynn. I'm sure you can survive one Sunday without wrestling your brothers! ", "Ashlynn. I'm sure you can survive one Sunday without eating mac and cheese!" She had finally had it, put her hands on her hips and exclaimed with a smile, "Can we please change the subject now!?" I think she got our point. "Maybe Ty just looks like a person on the outside but he's really a puppy on the inside" (about Ty being out of control-all-over-the-place). If any one's wondering - No. We can't control Ty. He is beyond us. Briggs has recently started reading at an even higher rate than before. He is starting to sound out words with a high level of accuracyand recognizes most small words by sight. I borrowed some Level readers from Ashlynn's first grade class today just to gauge where he was with his reading. I started out with Level 1, which he breezed through, no problem. Just you give you something to compare this to - Ashlynn is currently at a Level 12 which places her second or third highest in her class. 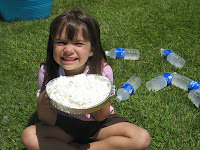 When she started 1st grade she was a Level 5/6. Briggs is probably at a Level 3/4 and he is still in Preschool. If any one's wondering - Yes. I think it's healthy to brag about your children's intelligence. It's just so cliche and self-gratifying, I can't resist! We found this cute video of Ashlynn when she was 2 or 3 singing. I can't believe how fast they grow. There's even a little cameo of Briggs. As many of you have already seen, we did a small addition to our house. 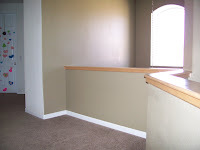 The upstairs was a funny shaped loft with an open space to the downstairs entryway. 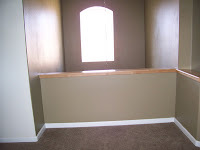 To make better (and safer) use of the space we knocked out a wall and added a couple of closets and Voila! instant play-room (well, not exactly instant). 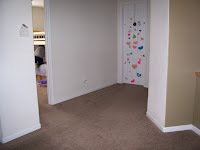 Here are the before pictures (taken while the previous owners lived here). 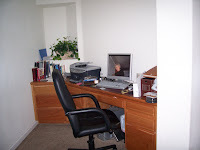 You must read this from Amanda's blog (yes, I plagerized). I honestly don't know where she gets it. Ashlynn asked me to tell her another story about me when I was little. So I told her of the time I was on the swim team and my relay team beat the school record. I explained that we swam faster than anyone from our school had ever done before for that race so they painted our names up on the record board. Ashlynn replied, "And was it up there for so long that they wrote a country song about it?!" Kate later asked her if she knew what a country song was and she said, "It's like, you know, "I been working on the railroad..."
Briggs has recently taken up a new hobby. He loves to play chess. 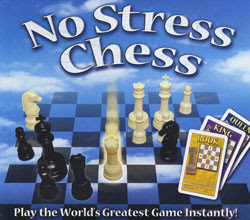 We got him a game called "No Stress Chess" that teaches the basics and how to move the pieces. He got hooked. 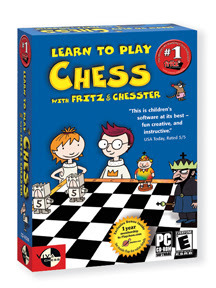 Then his Uncle, the real chess master, got him a great computer software program that is a great learning tool for kids - "Learn to Play Chess with Chester and Fritz" . Needless to say, we can't get him off of the computer. He has learned alot. Mom has even been known to sit down and play a little "opposition"
Thanks, Mark and Lisa for the game. He absolutely loves it.